Author: Debon, Nicholas Set In . 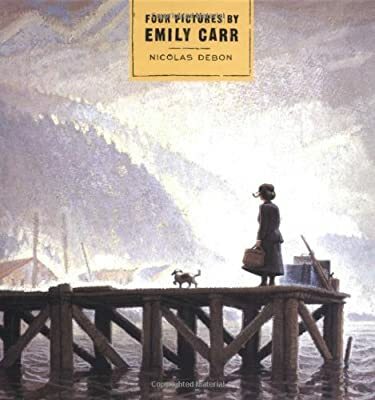 . .
Emily Carr’s life story is told in this highly original picture book by Nicolas Debon. Written and illustrated in comic strips, the book traces Carr’s life through four of her famous paintings. The first part, named after the painting, Cedar House, represents Emily’s first sketching trip to a remote village where she discovers the richness of West Coast native life and art. Autumn in France describes Emily at work in a Paris art studio and immersing herself in the "New Art" of Chagall, Matisse, Picasso and others. In Silhouette, Carr’s work is exhibited at the National Gallery and she has a pivotal meeting with artists of the Group of Seven. Finally, in Beloved of the Sky, Emily reaches her full potential as an artist. Nicolas Debon’s illustrations perfectly capture Carr’s determined, eccentric character and her times. The difficulties she encountered as a young woman finding a way to express herself as an artist are well documented as is her world.